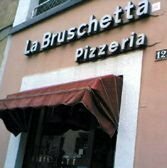 Evergreen, this family-run pizzeria near the Duomo serves specialties from Tuscany, though other dishes are also available. The tagliata is good if you need a red-meat fix. In summer, order panzanella, a salad with toasted bread. In winter, there’s ribollita a dense soup of vegetables, cabbage and bread. Not a spot to linger in: You can get in and out in time for the movies.